When I was in England last Fall I fell in love. Not with a person, or even the land or the culture, however fantastic they all are. No, I fell in love with the bacon. In England they serve, almost exclusively, back bacon. 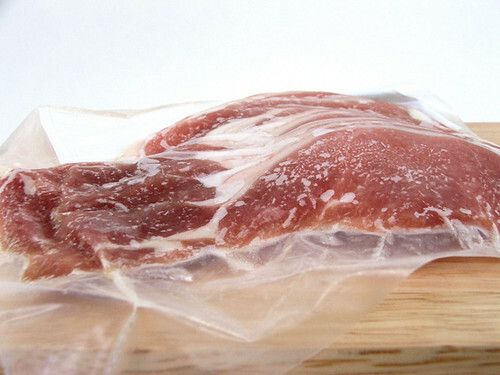 If you have never had this kind of bacon before it is a glorious mix of lean meat, similar to Canadian Bacon, with a streaky tail, similar to our bacon in the US. It is nothing short of a miracle, and I am so unhappy that the only way I can get this bacon in Texas is by ordering it from British expat food shops at a premium price. Of course, my love knows no bounds and what are a few dollars compared to the comfort of a well cooked, meaty rasher of bacon? So, I have a few packs stored in my freezer awaiting their weekend to be fried and eaten, and while I have enjoyed this singular way of eating back bacon, I secretly craved something different. Last year I received The Bacon Cookbook by James Villas. As the name implies, this book is about cooking with bacon and it even has a section with bacon desserts (which, of the ones I have tried, are quite good!). 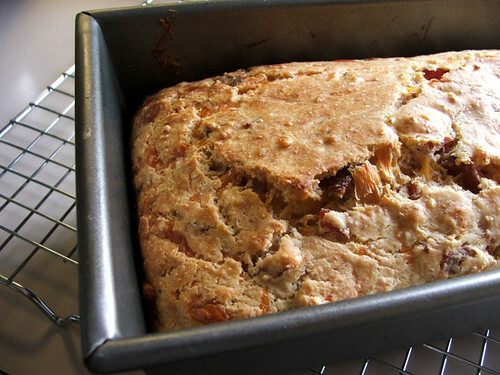 I found myself flipping through this book one Saturday when I found his recipe for English Bacon and Cheddar Bread. 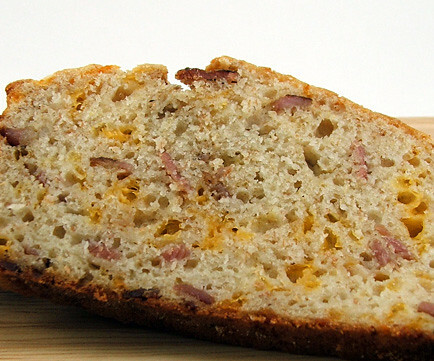 This recipe used back bacon, which is fried and chopped, mixed in the bread itself. Of course, I had to make it. I did modify the recipe slightly by mixing the all-purpose flour with some whole wheat graham flour for a hearty texture and nutty flavor. I also replaced some of the regular milk with buttermilk because (shameful as it is) I ran out of regular milk! Oops. 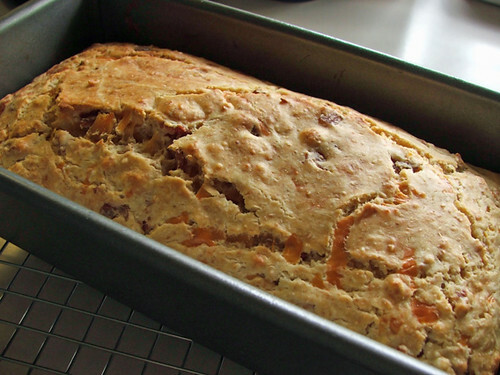 While the bread baked the house smelled like bacon mixed with Irish soda bread. 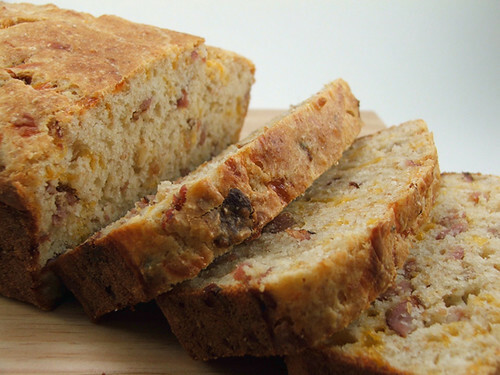 When sliced it had a tight knit crumb studded with bacon and streaked with cheddar cheese. The flavor had the right mixture of tangy cheese and salty bacon. 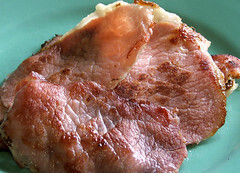 You can, of course, make this with out back bacon. 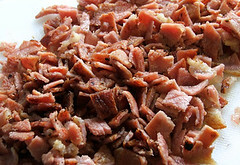 Just use 6oz of Canadian bacon and 2 oz of regular streaky bacon chopped and fried together in a pan. That should replicate the back bacon fairly well. You really must try this! Cook the bacon in a skillet until crisp. Drain on paper towels then chop into small pieces. Set aside. 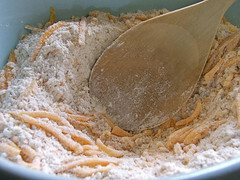 In a large bowl combine the flours, salt, baking powder, and sugar. 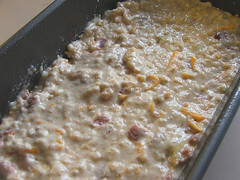 Add the lard and, with your hands, mix it into the four until it looks like coarse sand. 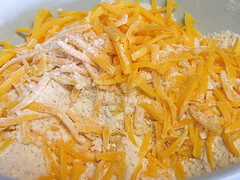 Add the cheese and toss to combine. 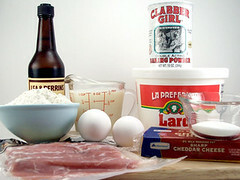 In another bowl mix the eggs, milk, buttermilk, and Worcestershire sauce. 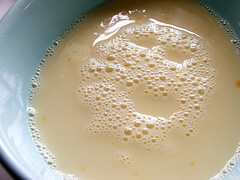 Pour the wet over the dry and mix until the dry ingredients are almost incorporated. 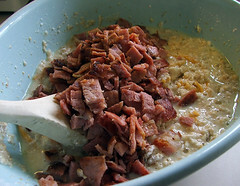 Add the bacon and fold in, making sure to scrape the sides and bottom of the bowl. Do not overmix. 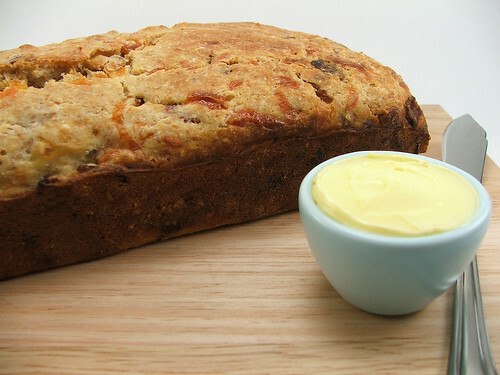 Pour the batter into the prepared pan and bake for 45 to 50 minutes, or until the top of the bread is lightly brown and a thin knife inserted into the center of the bread comes out clean. Cool in the pan for 10 minutes, then turn out on a wire rack to cool. 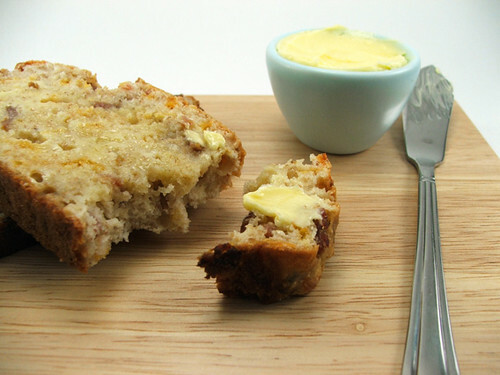 Serve slightly warm, with Irish butter if you can find it. (I recommend Kerrygold).